Read Part One, in which we make most of the upper-body armour. One of my favourite techniques as a classroom teacher is project-based learning. As it turns out, it’s becoming one of my favourite things about being a parent, as well. 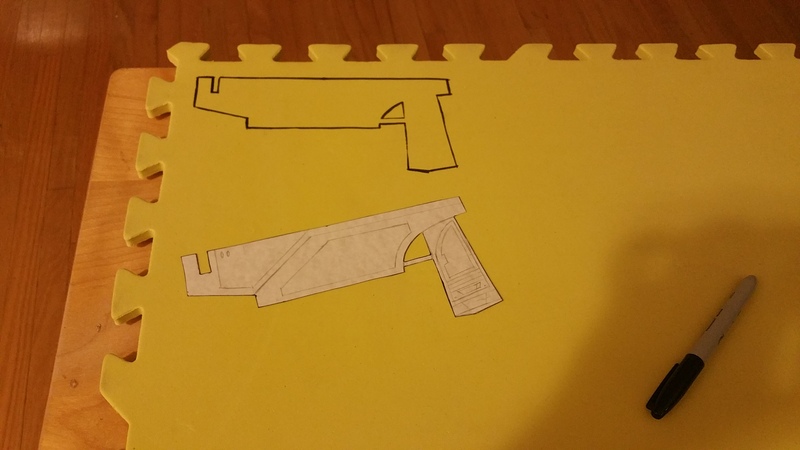 Tonight, Little Fish and I began work on patterning Sabine’s blasters while NJ prototyped Whistler’s Jennifire makeup. Our main job was scaling the design to fit her tiny hands. We started by measuring Sabine’s hand in a screen capture. As it turned out, her hand, measured across the knuckles, was exactly ¼ the size of the Fish’s hand. Scaling means multiplication, and a nice round number like that means that it would be much easier for her to do in her head. All those measurements, all that math! We began measuring the gun and scaling the measurements, but quickly we encountered a measurement that was exactly half a centimetre. Well, as it turned out, tonight was the night my 8-year-old would learn to multiply fractions. That made scaling each measurement slower going, but the process of measuring each part of the blaster and scaling the measurements was awfully satisfying. Eventually, the tiny picture outlived its usefulness, and we moved to a larger picture that was at a scale of 1:1.5, which meant more multiplying halves. At about the point we finished the pattern, it was time for my Little Fish to go to bed, so I took over fabrication. We’ll convene tomorrow to build the other one. 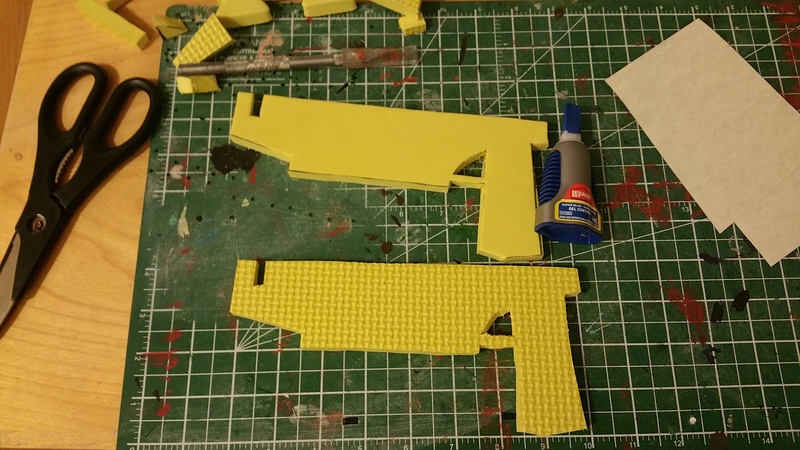 I started by cutting the body of the blaster to double the thickness of the foam. The EVA floor mats I bought were pretty thin – only 1 cm thick – and Sabine’s blasters are bulkier than that. Of course, cutting out the halves left me with pieces that wouldn’t quite marry together the way I wanted. So I needed to sand them – substantially – after the fact. Sanding EVA foam is not fun. Cutting it is, shaping it is. Sanding it is not. And I expect more sanding in the future, to smooth everything out, once a coat or two of primer is applied. Blargh. Still. At least the two pieces looked like one piece now, more or less. Then layer after layer of dollar-store sheet foam to build up the details, and tracing details on. The other thing that I did with those pen lines is score them with my penknife and hit them with a blast from the heat gun. The internet assured me that this would make the foam pull away from the score, and leave lovely detail lines that would add surface detail and assist with weathering. The internet was 100% correct. Finally, the barrel. At the same time I picked up those dollar-store foam sheets, I picked up some dollar-store foam tubes. I cut one of these into a couple of chunks and placed them as the barrel. Like the rest of the gun, I did a bit of scoring on the barrel and hit it with the heat gun for a second. THAT MIGHT HAVE BEEN A MISTAKE. The foam tubes aren’t as dense as the other foams, and deflated some when I ran the heat gun over it. Still, it turned out okay. Still, the thing turned out pretty well, on the whole. I’m looking forward to doing the other one with the kids. Like the other armour, I’m most excited about the paint job. I am so looking forward to painting these! Sabine’s character is an artist, so each piece is a unique work of art. And each piece of my Little Fish’s costume will be too. Until next time, folks, paddle your own canoe. Tagged cosplay, costume, Halloween, rebels, star wars. Bookmark the permalink.